My good friend Michele whom I met while in Budapest met me in Bangkok late on Friday night. Since our biological clocks are still a little off, we woke up at about 6:30 am ready to start our Saturday. We planned on heading out to the Grande Palace first, a must see when in Bangkok. After an hour drive into the city with all the congestion and traffic we were ready for a free tour in English around 10 am. As soon as the taxis unloaded us, we went to purchase our tickets in order to enter the Palace. A nice (so we thought) Thai man approached us and asked where we are from, what we were doing in Thailand and spoke enough English to keep us intrigued for a few moments. Our new friend then explained to us that the Palace is only open to Thai nationals on Saturday mornings until noon. Michele and I were completely bummed because our daily planned had been thrown off and we didn’t know what our next move needed to be. He looked at our map and showed us different places we needed to go and also told us that our cab driver that brought us to the Palace ripped us off, which we already knew. The Golden Buddha, an expat center, and another stop were suggestions he told us to take until noon when we could come back and see the Grande Palace. He said, “You take tuk-tuk 100 Baht, den come back Grande Palizz. Ok?” You can imagine how thrilled we were to have our morning planned out for us and at that price! Yippy, we’re thinking. He talks with a tuk-tuk man we hop on and zip through the back streets to the Golden Buddha. 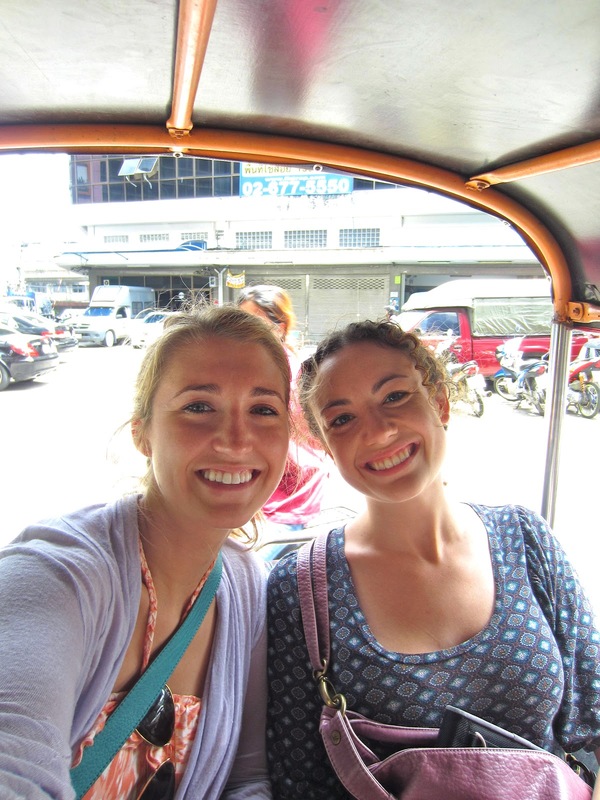 For those who aren’t familiar with a tuk-tuk, it’s like a glorified go-cart that is street legal. 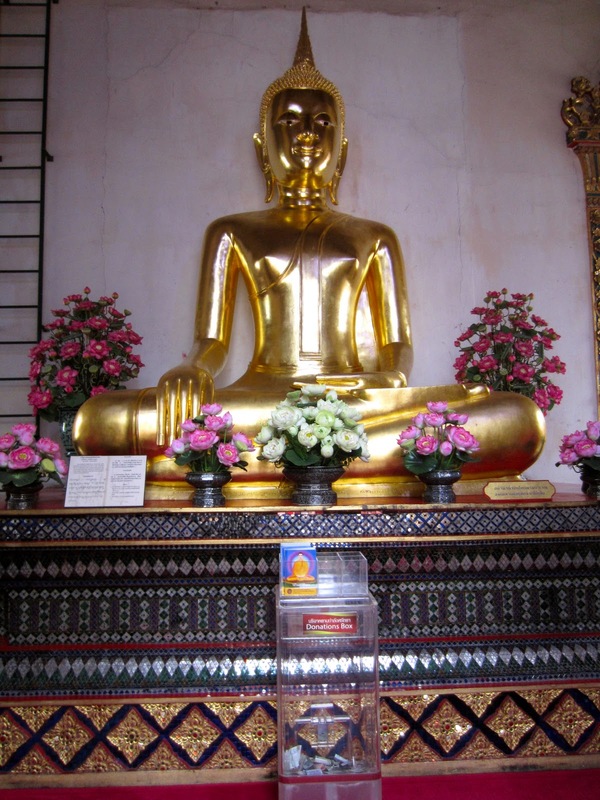 At our first stop, the Golden Buddha is actually two giant gold Buddha’s housed in an open building. One is 200 hundred and the other 700 years old. Monks, tourists, and locals go to pay respect and give offerings. The meticulous detail and elaborate features on these statues must have taken ages to complete. After exploring for a while, we board our tuk-tuk again that had been waiting for us and he tells us our next stop, but we can’t quite understand what he is saying. I imagine it’s a stop on our map that our Thai friend at the Palace pointed out. We pull up and stop at a tailor shop in town. Michele and I are quite confused as we disembark our transportation and enter the store. We politely take a card from the tailor and leave. 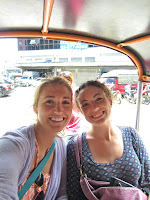 Once we scooch back on the tuk-tuk, we soon make another stop this time at a jewelry store. As we enter the building, we start laughing hysterically because we know we’ve been baffooned and leave after about 3 minutes. Racking our brain, why would the Palace be closed until noon? No this isn’t right. We demand to our driver to take us back and he explains that he gets free gas coupons at stores he brings us to so “we help him.” Wow. Our tuk-tuk stops at about 2 gem stores and 3 tailors on route back to the Grande Palace. The adventure ended up being my favorite part of the day because we laughed so hard and probably saw much of the city that I normally wouldn’t have otherwise. 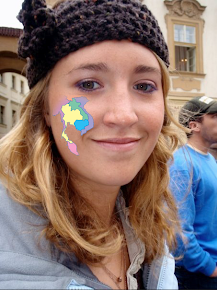 Eventually we made it back to square one with a bit more awareness under our belt. Check out the Eye Candy tab for an album of the Grande Palace and Bangkok!